My brother Kevin shot me a text sometime last week asking if he could make good on a promise to take Mackenzie to Six Flags. Of course, that meant that someone would have to get her there. I tried to pawn it off on Nelson. He has a business associate in Atlanta and I suggested he drive Mackenzie up and meet with the guy. Nelson, however, is not a fan of driving or theme parks so it was a hard sell. I told him that if I took her, that would mean he would be here with all the kids. He felt it was a fair trade. When I told Kevin that I would bring her, he said he'd buy my ticket so that I could go to the park with them. 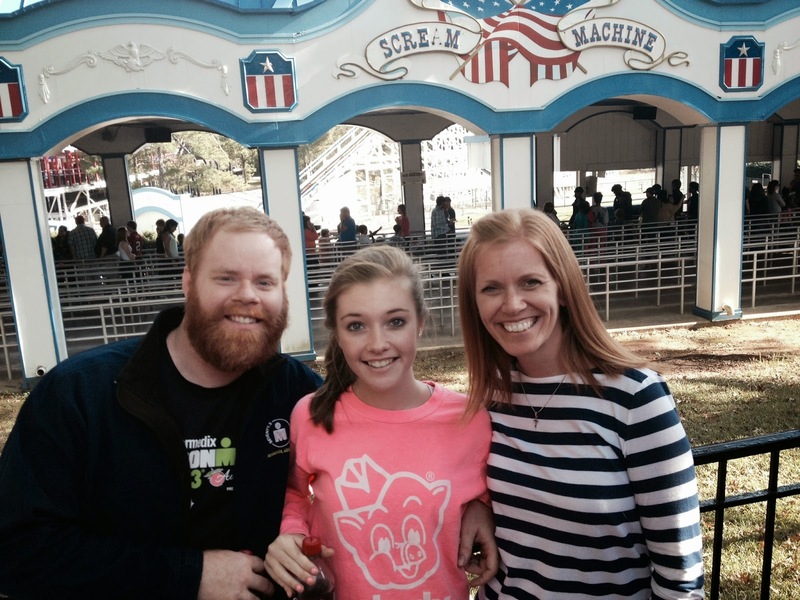 I couldn't remember that last time I had been to Six Flags, so I let him. Though I was excited to spend the day with my girl and my brother, I was nervous. I love roller coasters. I always have. However, the older I get, the less they love me. These days I get nauseated swinging next to the kids in the backyard. Throwing up at a theme park is not top on my list of ways to spend a Sunday (or any day for that matter). Mackenzie begged and Kevin egged me on. I figured, if I was going to be in the park, I had to at least try to ride the things. 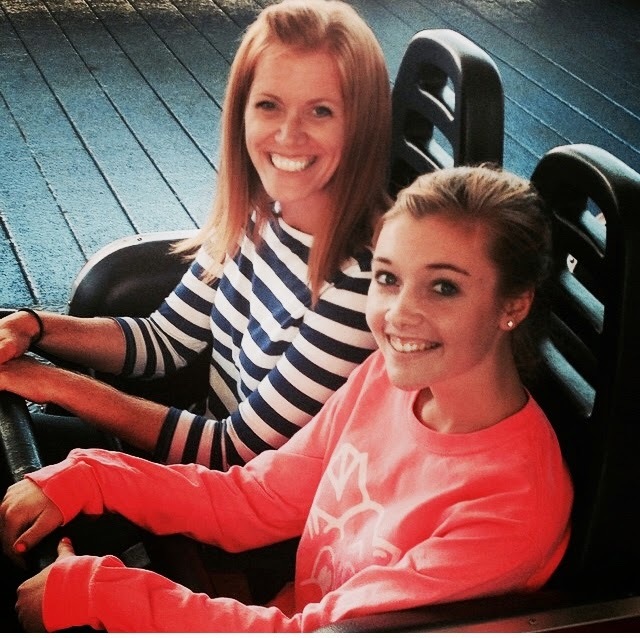 We went on every ride. They were super exciting and worthy of a few screams. I got nauseated every single time. Thankfully, we had to wait in line for most of the rides so that gave my stomach time to settle before I put it through the same thing again. However, at the end of the day, when we started to ride a few for the second time, my stomach had had enough. I sat the last one out. Unfortunately, it was Fright Fest at Six Flags so when the sun went down, the zombies came out. Let me just say that sitting out a ride in order to settle your stomach is not helped AT ALL by a zombie jumping out at you. Didn't help...not at all - but I already said that didn't I. Said zombie was very, VERY lucky I didn't throw up on him. All in all though, I'm very glad I went. It was a great time with two of my very favorite people. I can also now list all the newest and scariest rides in the "been there, done that" column so that they can be avoided until Uncle Kevin decides to torture me again. This year's Social Dance Club is so much more fun and easier than any other year. They only have a dance once a month and every dance has a theme that helps them choose how to dress. This month's was a costume party of course. I started talking to her about this dance after last month's Beach Party. I suggested numerous options and scoured the Internet for DIY ideas. Unfortunately, after all that, she saw a picture of some super heroes and decided that nothing else would do. Now we have plenty of super hero costumes and props for little people. However, most of it is not Mackenzie's size, petite as she is. I tried to talk her into anything we had the stuff for but to no avail. The eve of the dance, she got an invitation to go shopping for a costume with a friend and her mom. I told her that I was not willing to pay for a costume she would most likely never wear again when we had plenty of other stuff she could use. Still she was not convinced. I let her borrow some money with the understanding that anything she spent was going to come out of her account, not mine. "How much do you think a costume will be?" she wanted to know. I told her I thought it would be at least thirty dollars, but probably more and off she went, money in hand. I got a text from the mom that she had found the most perfect Wonder Woman outfit that was only $50 and could she pretty, pretty please get it. Well, I told her that I wasn't trying to spoil the fun but I thought that was a lot of money to spend. However, it was Mackenzie's money, so the decision was hers. We exchanged a few more texts and then she sent me this. I have to say that the girl looks great. The mom told me people stopped her in the store and told her the same. After I saw the picture, I figured it was a done deal. She looked amazing and it was her choice, and maybe...just maybe I could squeeze myself into it for a costume party we have next weekend. When she walked in the door, she had a relatively small bag in her hand. "Hey. I saw the photo and you looked great. Let me see it," I said. What she pulled out of her bag was a Batgirl belt that she purchased for $10. "Oh Mama," she slightly moaned, "the costume was so perfect...but also SO expensive. It was hard." "I am so proud of you! Sweetie, life is full of hard choices. There are a lot of great things out there that cost a lot of money. Most of them are not needs. It's a good lesson to learn. You'll be happy you have that money for something more worthwhile in the long run." She made a few phone calls and I ran her to a couple of friend's houses so she could put together a Batgirl costume. Honestly, I think it's every bit as good as the $50 store bought one. Hopefully she learned that you don't have to spend a lot of money to look good or to have fun. It will serve her well in the future as she saves us all from the bad things lurking in the dark. 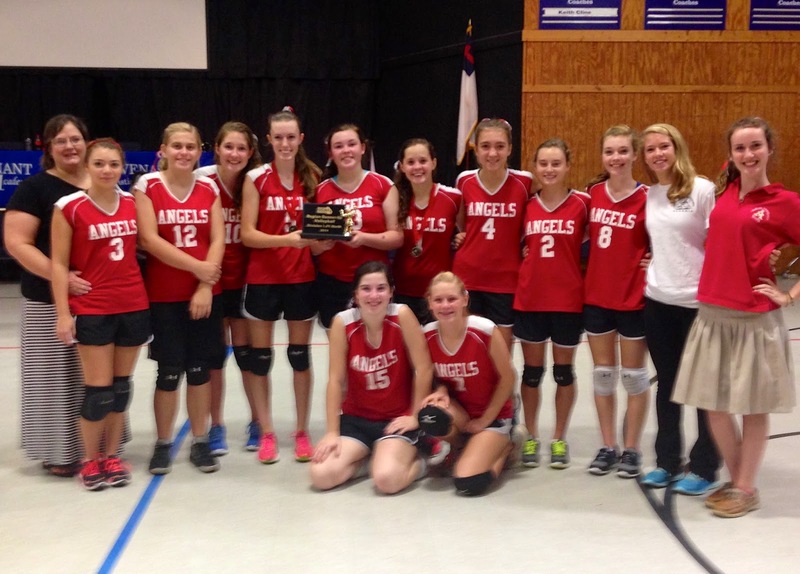 Mackenzie's JV volleyball team came in first place in their region, and today was the regional tournament. They were playing for the championship in Atlanta and I knew I needed to be there for her, so Nelson graciously agreed to stay with the other kids. I made the three hour drive with three other moms. Our time together in the car was almost as fun as cheering for our daughters. The girls arrived to find out that they had to play back to back games after that long drive. Not exactly the way it's supposed to go for the first place team. They handled themselves with grace and maturity that went far beyond their young years. 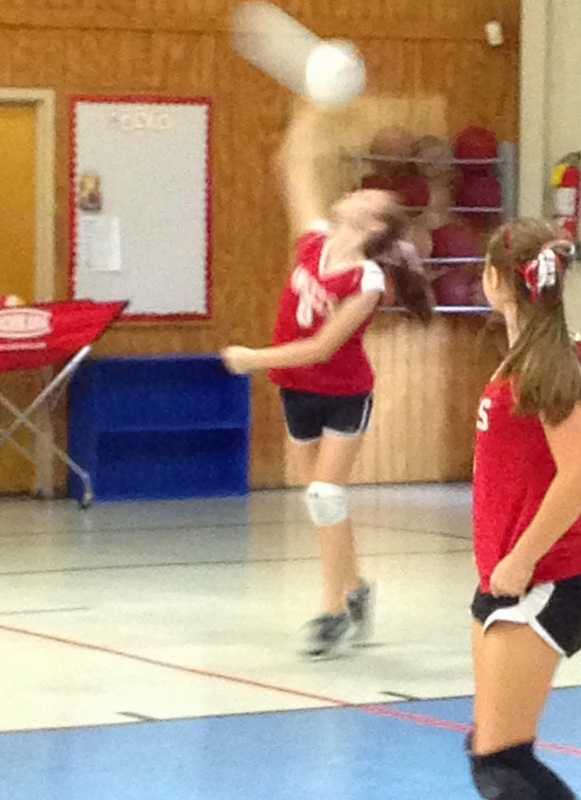 They beat the first team pretty soundly and had the entire gym cheering against them for the second match. 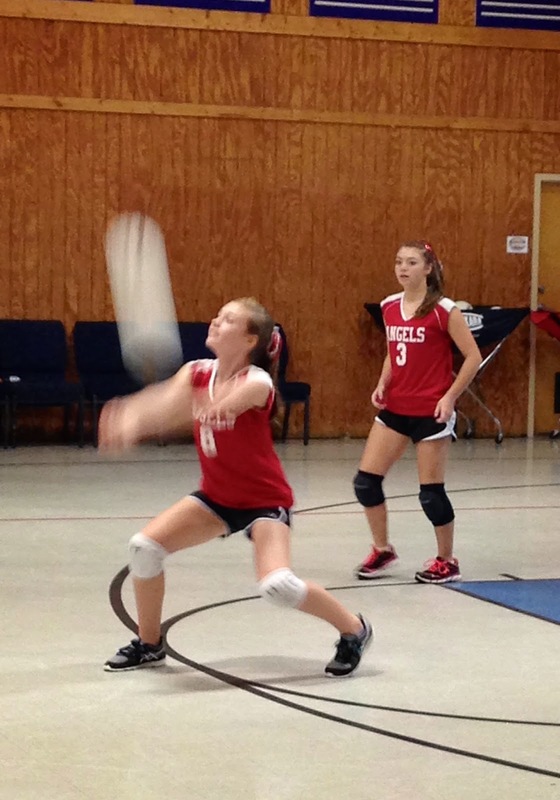 In the first game of this match, Mackenzie served eight serves in a row. It was amazing to think that just last year, she couldn't serve overhanded. They won that first game but then lost steam and ended up barely losing the match. I honestly believe that had they had a break between their matches, they would have won. Oh well, second place is not too shabby. Sports keep us very busy in an already busy life, but scenes like the one above remind me why we put up with the all of the inconveniences of practices and games. Sports build character and unity among the players. These girls have been in school together for nine years now. They still love each other. They support and encourage one another. It is a worthwhile investment. Good job Angels on a great season! You played hard and finished strong. I am so proud of all of you. Leaving the beach is always hard. Waving good bye to an ocean that waves back, seeing the gigantic fountain in the pool in the rearview mirror, and watching the bike paths fade into the distance is always hard. It's a sign that we're leaving the dream world of no phone calls, knocks on the door, or places we have to be and going back to reality. 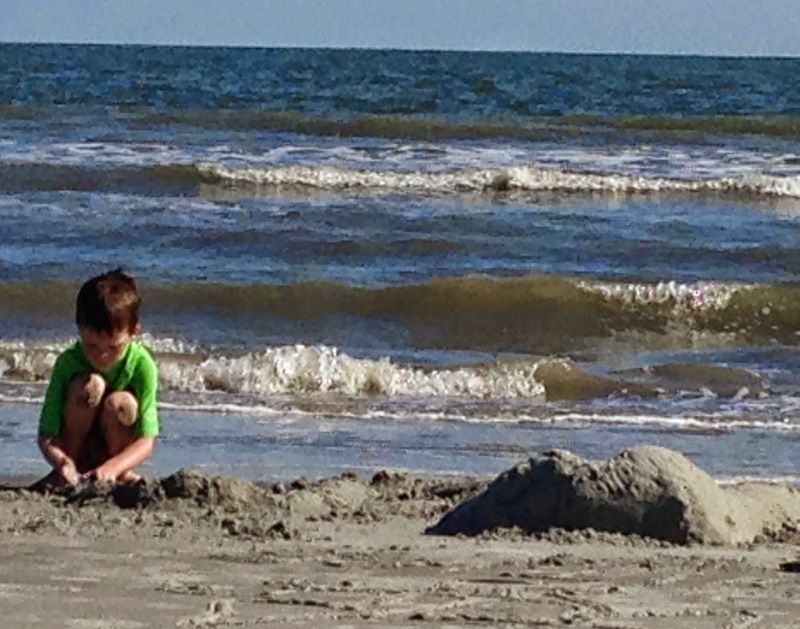 I love the beach because it forces the kids to play together. The boys play together every day but the two oldest are kind of phasing out of the "I have got to get outside NOW!" phase of childhood. 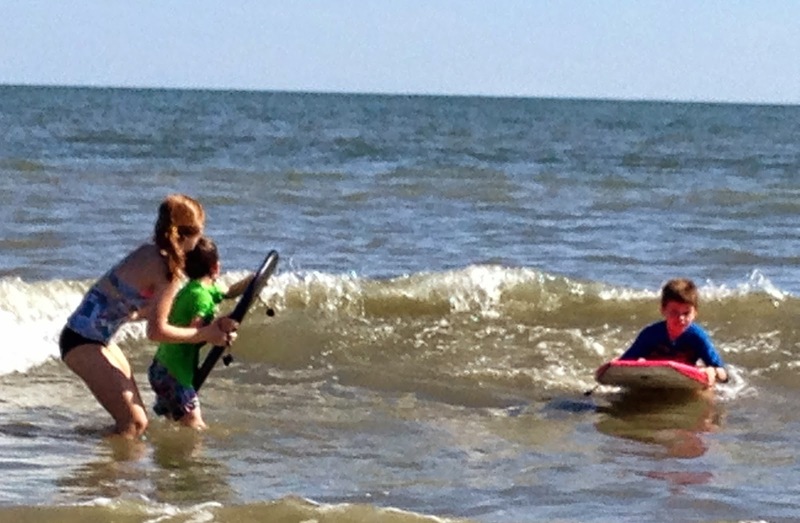 Watching Mackenzie help her brother find the best waves was priceless. Sand is almost as fun as the waves. If I had the beach in my back yard, I might never see this guy. 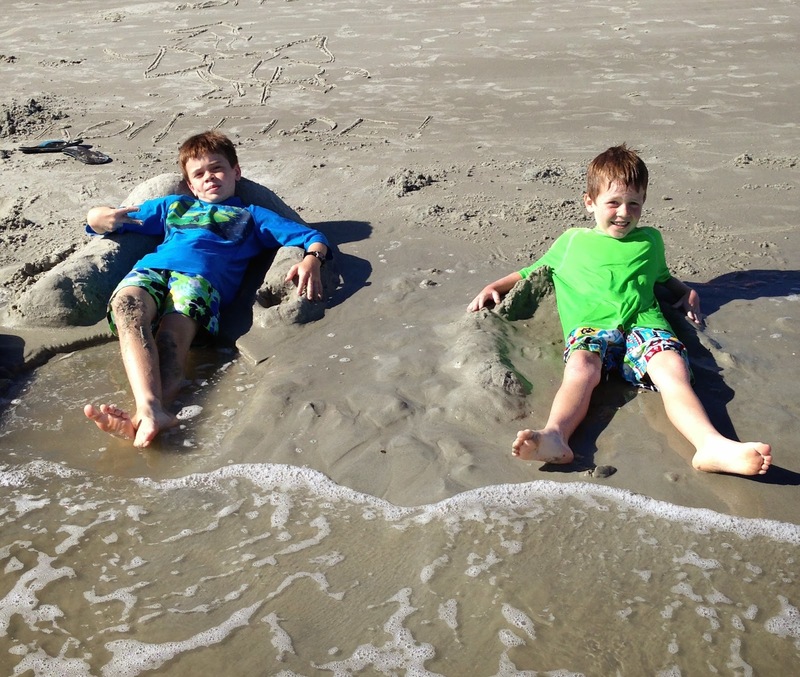 They even learned to make their own beach furniture. Ah, doesn't that look relaxing? Nope, not to me either, but they loved it. And this gal loved it all. 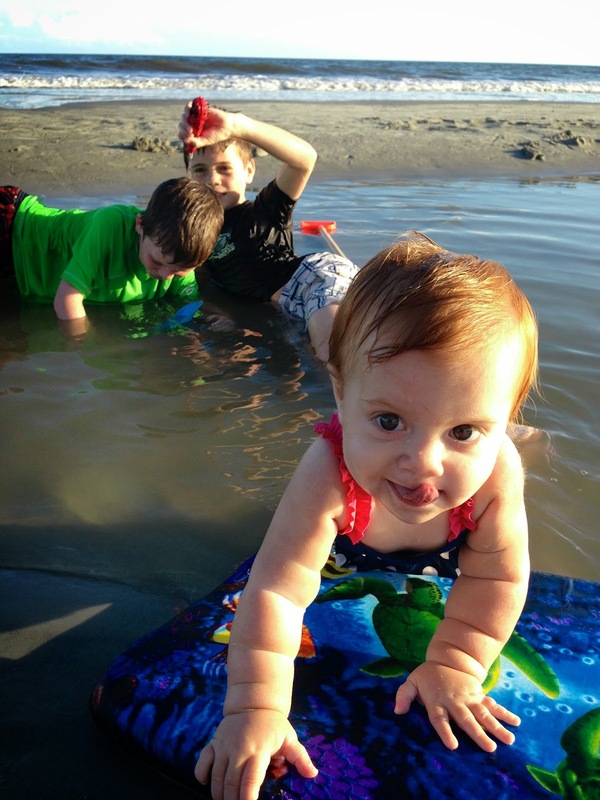 The sand, the waves, the tidal pools all provided endless opportunities to find foreign objects and stick them in her mouth. Endless fun for her, vigilant watch for me. 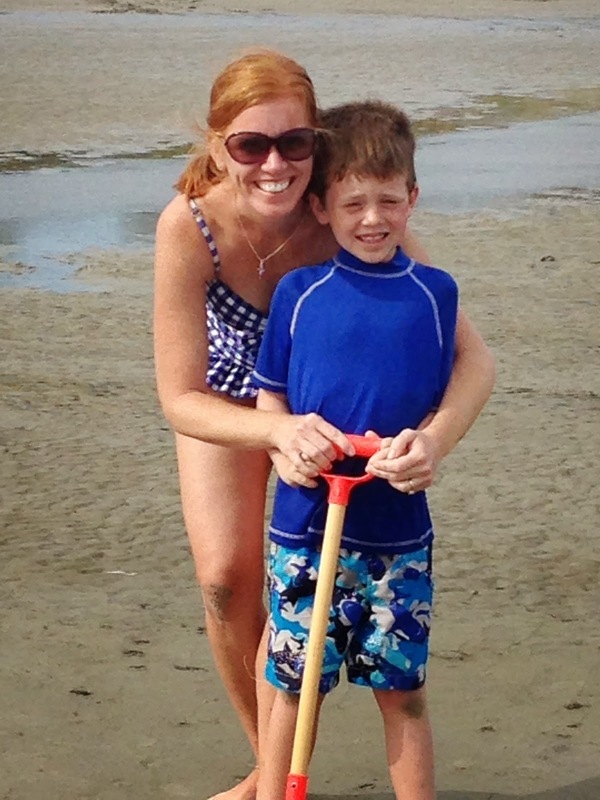 Max and I took a little Mommy date to the beach one day. 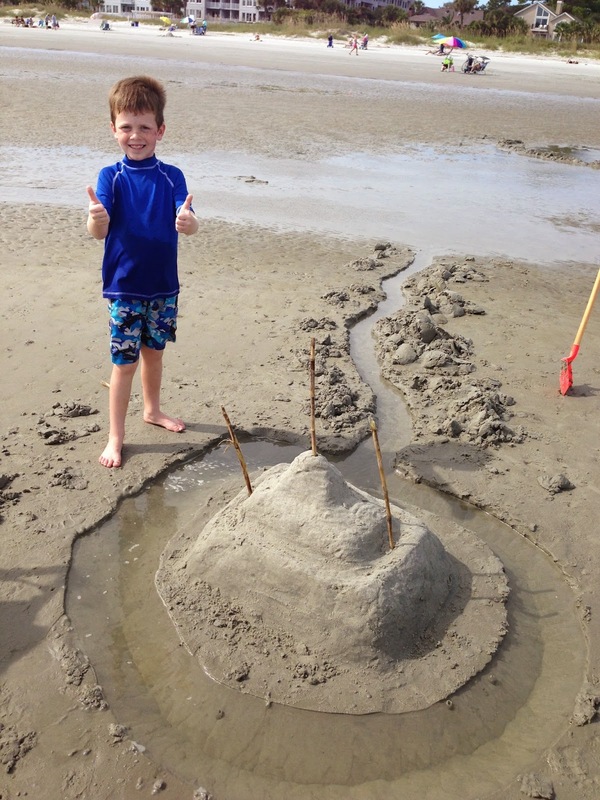 We built an awesome castle with a massive moat that fed itself from a river we dug from a tidal pool. Way cool. 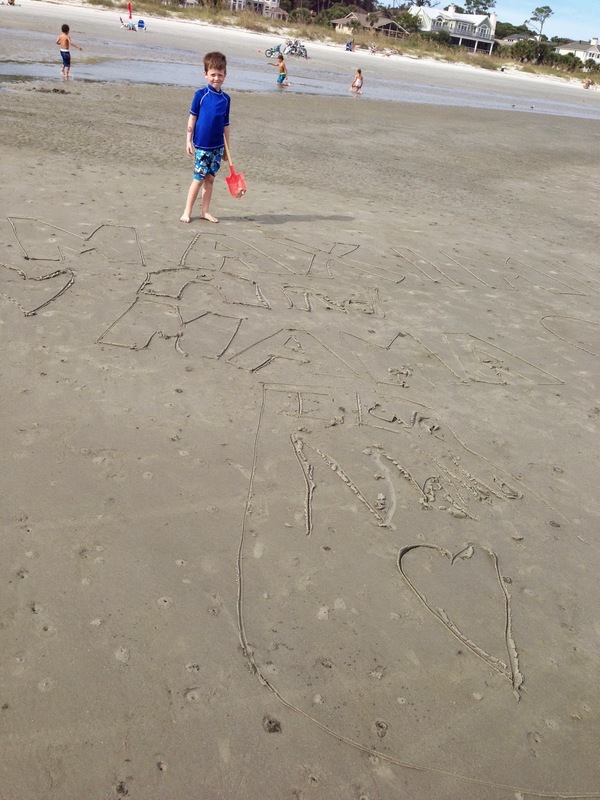 If you click on the above picture, you'll see that while he put the finishing touches on the castle, I was writing our names in the sand. And yes, I wrote out Maximilian because he's going through a phase where he wants to use that all the time. He saw what I was doing and added his own message at the bottom, "I love Mama". Best Max date ever! This site was especially sweet to me. 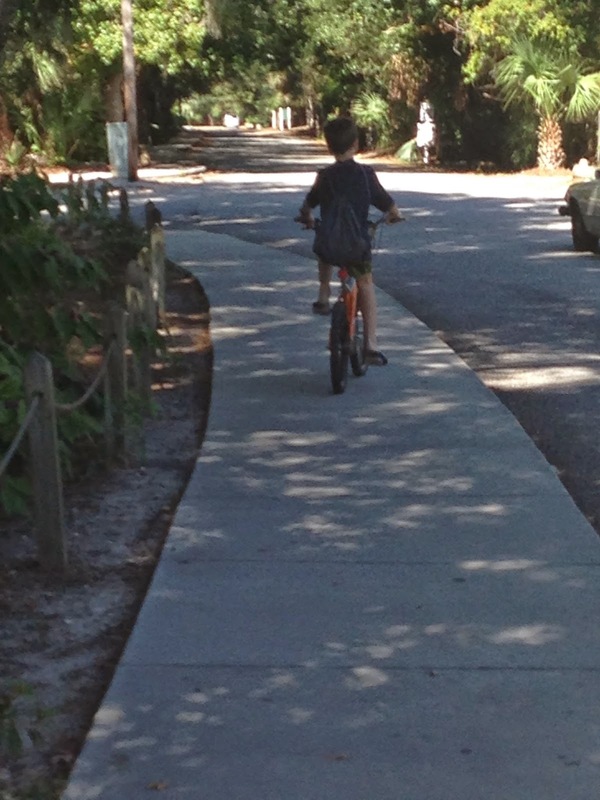 He learned to ride his bike just a week or two before we came to the beach. This is the kid I thought might never walk or climb the stairs. Riding a bike wasn't even on my wish list for him. Look at him! Amazing! A little Mancala pool side is always fun. This is where we spend the majority of the time. There is a giant pool, and hot tub the size of some back yard pools, a ping pong table, corn hole, and music. We came in only when it became necessary to eat. Even Felicity got into the corn hole. Finally a game that involves putting things in something instead of taking them out. Now if we can just take that knowledge home. We even got to hear pirate stories fireside while roasting marshmallows. This event just so happened to follow our pirate adventure. How great is that? It was a great get away. Now we just have to hang on for Christmas break. One of our favorite beach traditions is playing Bingo. Sounds funny I know. Here's the thing. The prizes are really nice. In the past, we've won things like a free large pizza, gourmet cupcakes, and kayak tours. With six of us playing, the odds are in our favor for walking away with a least one prize. This time I was the first one to get Bingo. 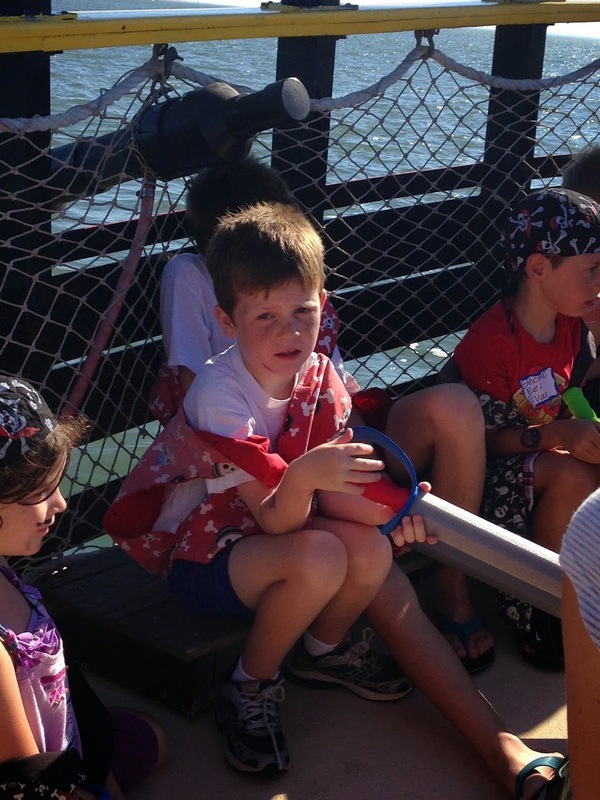 The prize - a free ticket for a Pirate Cruise. Aiden won this prize several years ago and loved it and the two little guys hadn't had a chance to go. 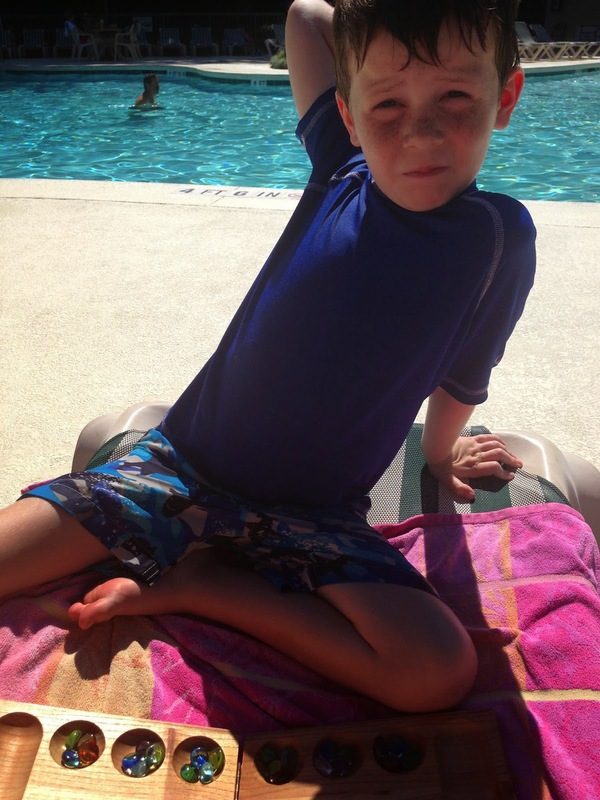 Mom and Dad graciously agreed to buy a ticket so that both Dawson and Max could go. I was a little leery of the experience. My favorite thing about the beach is not having to be anywhere at any specific time so the thought of getting everyone showered, dressed and ready for this outing in the middle of the day seemed a tiny bit inconvenient. Funny how the beach mentality changes everything. I'm glad I got over my lazy, beach self. The cruise was so much fun. 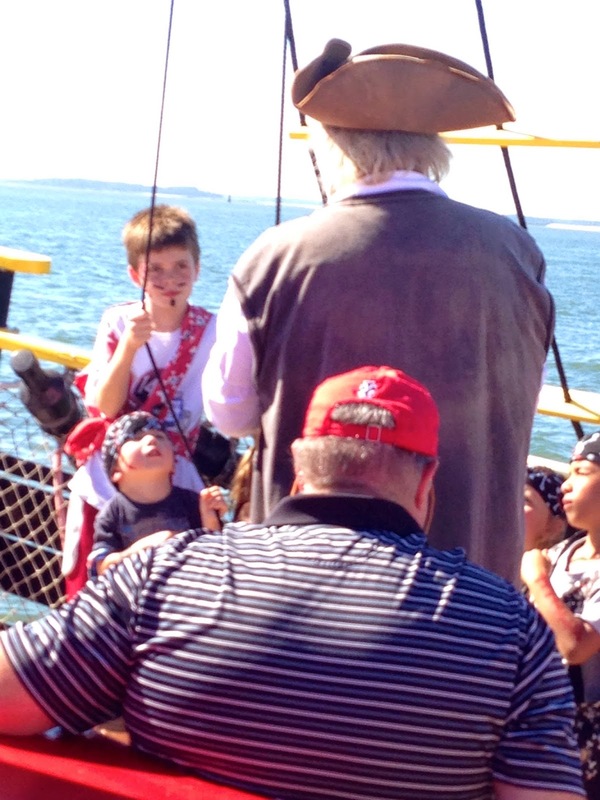 The pirates were superb and the boys had a blast. Thanks Mom and Dad for yet another wonderful memory! This afternoon, as I was sitting in the hot tub with Felicity, I was watching a young father keep an eye on his toddler daughter. He was having a conversation with an older woman that he ended by saying, "I don't know how you guys did it without iPads, smart phones and DVDs." His words hung in the air, too heavy to float away. I couldn't let them go. 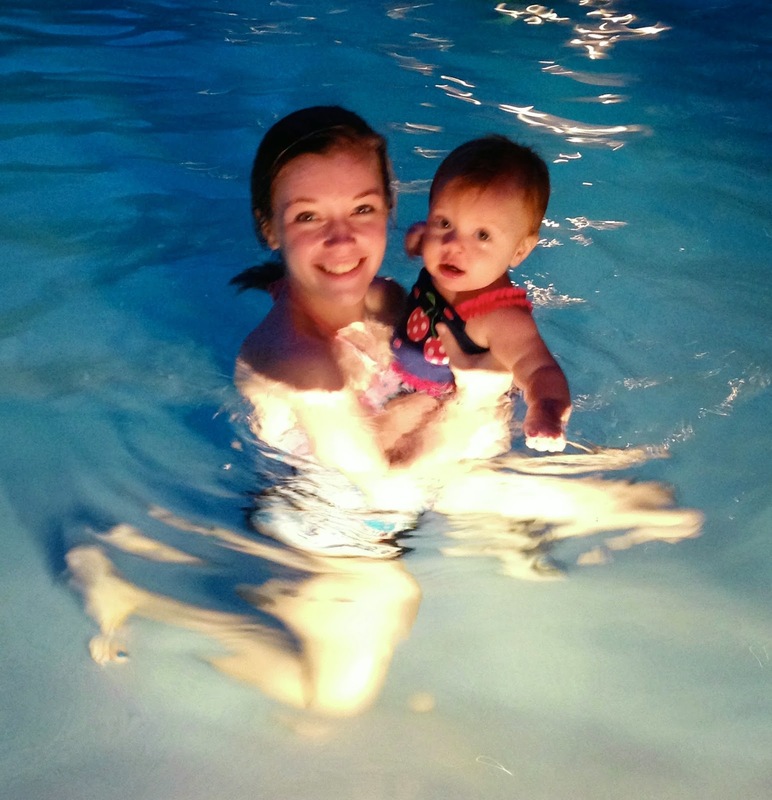 I watched Felicity play with the bubbles and wave her hand through the water. It's been funny to me that the more babies I have, the fewer toys they have. I've found that with age comes a little wisdom, and I've realized that babies don't need much at all to be entertained. I remember when I had Mackenzie, people would ask me what I do all day. They wanted to know how I entertained her. 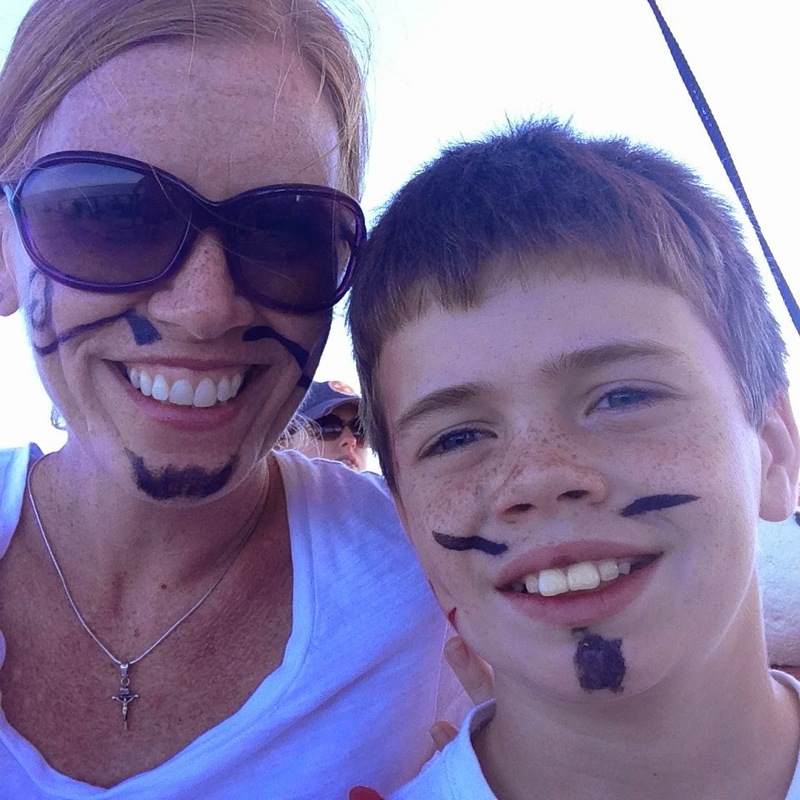 Funny, even as a teacher, I never felt the need to entertain my kids. As babies, they all just followed me around the house while I did what needed to be done. Of course, half of what I did was clean up from them undoing what I was trying to do. Don't get me wrong, they played around my work. There were rides in the laundry basket and loads of fun crawling through the sorted piles of clothes. There were boxes to be emptied as I gathered recyclables. There were numerous pieces of Tupperware to be emptied from cabinets as I cooked. There were so many things to look at as they rode in the shopping cart. There were faces to smile at and people to chatter to. There were also songs to be sung, books to be read and paper to be colored on. Felicity's current favorite kitchen game is to take down the towel that hangs on the dishwasher. She takes it down and carries it everywhere. I trip over it eventually and put it back. She immediately crawls over and takes it down again with the guiltiest grin you've ever seen. This happens multiple times a day. It NEVER gets old. Right now, she's tugging at my shoelaces as I type. This is after I opened a bucket of Lego Duplos for her to rummage through. Apparently, I'm much more interesting than a bucket of blocks. I'm happy about this (not usually in the moment I need her to be occupied, but always in the long run). It makes me sad when I go out in public and see kids of all ages (adults included) attached to an electronic device. We have been in restaurants and seen entire family units looking down at some screen in lieu of any eye contact. We have all (I am as guilty as the next person) become so concerned with social networking, we've forgotten the value of social interaction. None of my kids (including my 9th grader, much to her chagrin) have a cell phone. They don't have iPads or iPods. They share a computer at home for homework. This has been a very deliberate decision on our part. We hate the idea of them being so plugged in that they tune everything else out. We realize full well that there will be a time when it will be unavoidable. We struggle with our decision the older they get. It becomes an issue as Mackenzie babysits for people with no home phone. Her friends text her on my phone. We're trying hard to hold off until it's more of a need than a want. Our kids operate old school style. If they walk to a friend's, they have to call when they get there. If they leave that house, they have to call first. They don't leave without knowing exactly when they need to be home. Let me also say that we have a DVD player in the car that we use on long trips (after we pray the Rosary of course). 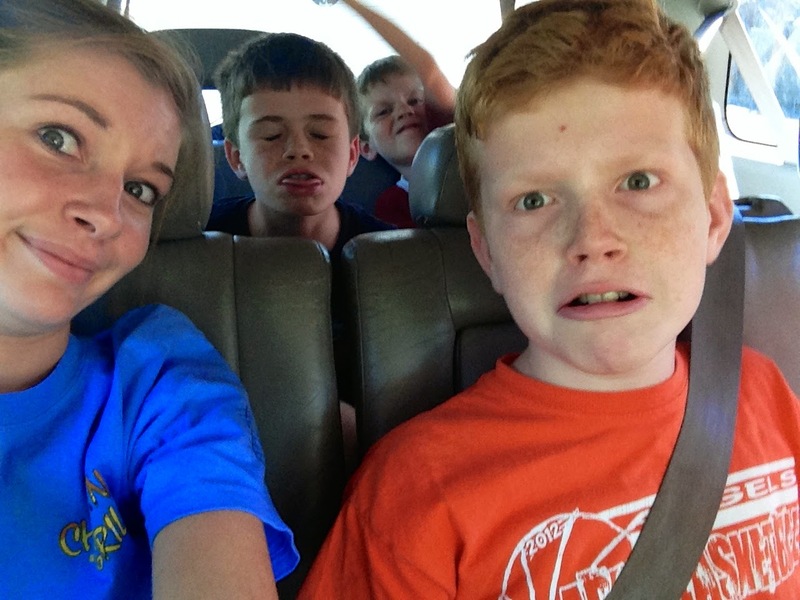 All of the kids get sick when they read in the car and they don't watch a lot of TV at home so we felt like a road trip was a fine time to do that. Also, it makes for a very peaceful drive and lots of good conversation for Nelson and me. However, if we go to one of the kid's sporting events, we go to support that child. We make the kids watch the game being played, not a game on a video screen. If we're driving around town, we talk to each other. When we're waiting at a restaurant, we play games, practice math and solve the world's problems together. We're teaching them social skills and encouraging them to entertain themselves with things that keep their minds active (we hope). At the end of the day, our hope is that if they meet you, they will be able to look you in the eye, shake your hand firmly and say hello. If they're letting you in on a joke, they'll know how to wink using their eyes instead of an emoticon. They will learn new things from their conversations with you. They will also probably have Facebook and Instagram accounts (that is, if they're still around when they finally get a smart phone). But hopefully, those accounts will pale in comparison with their friendships and interactions with the real people around them. The beach in October is my favorite beach time of the year. There’s something about going when it’s not vacation season that makes it all the more enjoyable. The crowds are minimal and the weather is mild. It’s harder to get here because of the missed schoolwork that has to be done and all the carpools, lessons and activities that have to be rearranged, but once we’re here, it’s always worth it. This year I am even more grateful for my parents’ unending generosity. This is their place and they let us crash every year. We bring the grand kids and a few meals to share and they take care of the rest (and spoil us all rotten). My favorite thing about this week has always been the fact that it forces my kids to entertain each other since there are no cousins and very few young people around. When it comes down to it, they love each other and get along beautifully. It’s been bittersweet the past few years because we’ve had to bring Mackenzie back early. Once they reach middle school, we’ve learned that missing a full week of something like a fast moving math class that covers a new concept every week can really hurt them. This year Aiden, MUCH to his chagrin, had to go back with her. It was a sad afternoon for all of us when they left yesterday. It’s so funny how the addition of the baby has had me pining once again for them all to grow up. It’s been hard for me to understand friends of mine who are bemoaning having seniors or college kids who are moving off to school. Independent young adults sound pretty great when you’re still changing diapers and getting up in the middle of the night. However, yesterday I got a glimpse of what they feel. I understood that Mackenzie’s time with us will get shorter and shorter. Aiden and Dawson won’t be far behind. And, one day soon, it will be just the two of us with poor little Felicity hanging out. Yes, the grass is always greener on the other side until you get a closer look. The trick, I think, is to appreciate the grass you’re walking in every step of the way. Last week at our household dinner, which now includes an extra ten adults and one child, Dawson mentioned that he thought chicken and dumplings would be a great idea for this week. The gang agreed and I let Dawson know that it probably wouldn’t happen. It’s a very labor intensive meal and I’m never sure what kind of day Felicity will have. Planning a six hour meal is risky at best. “Chicken and dumplings,” was my reply as I continued tearing apart the cooked chicken. “How long have you been working on this?” he wanted to know. “All day,” I answered honestly because for some reason I thought it would be a good idea to shop for the meal the day I made it. “Because you like it,” I said looking into his giant eyes.